Of course, we’re not going to spoil the answer for you. What we can say is that the key to the mystery is, well, a key. 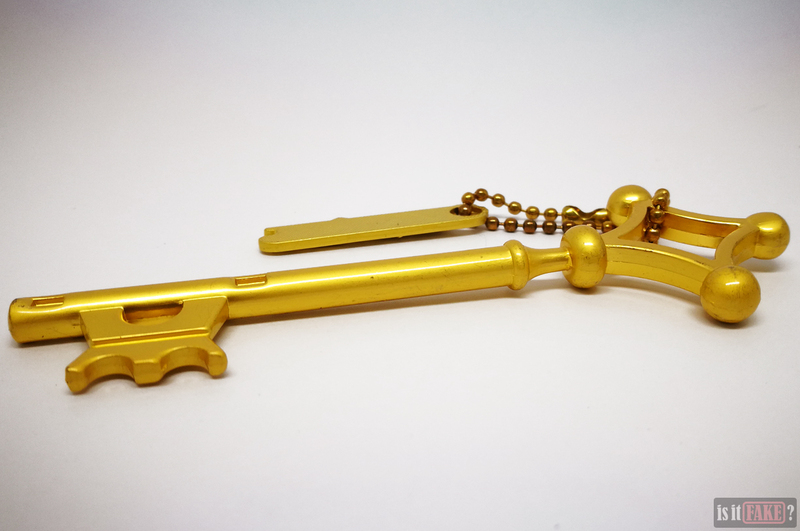 The key in series protagonist Eren Yeager’s possession, to be precise, handed down to him by his father, the enigmatic Grisha Yeager. 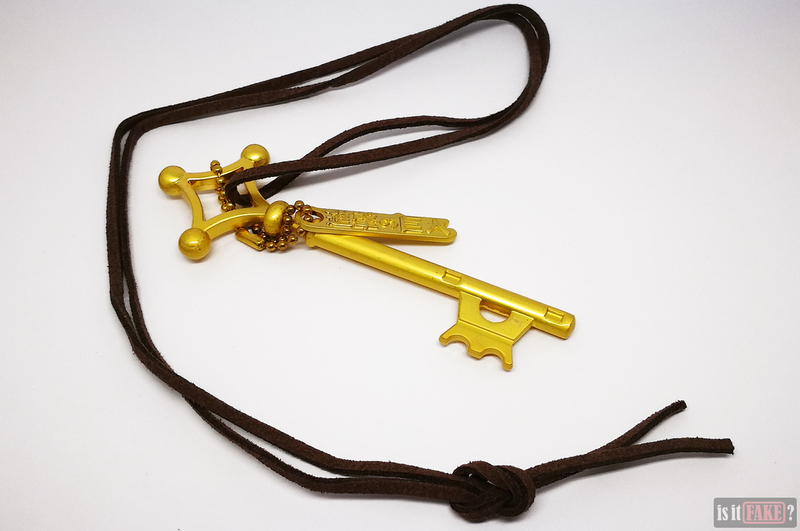 To make carrying around the key more comfortable, Eren keeps it attached to a loop worn around his neck, thereby creating a key pendant. Such an important artifact makes for great merchandise. Small wonder fakes, such as the item we’ll be reviewing today, exist. It pays to exercise extreme caution when shopping on eBay. This is because many items for sale on this e-commerce site are fake. The makers of such fakes care little for quality standards, often producing ugly, inferior replicas of licensed merchandise. To cut manufacturing costs, they also use inferior, sometimes toxic materials in the process of creating their bootlegs. 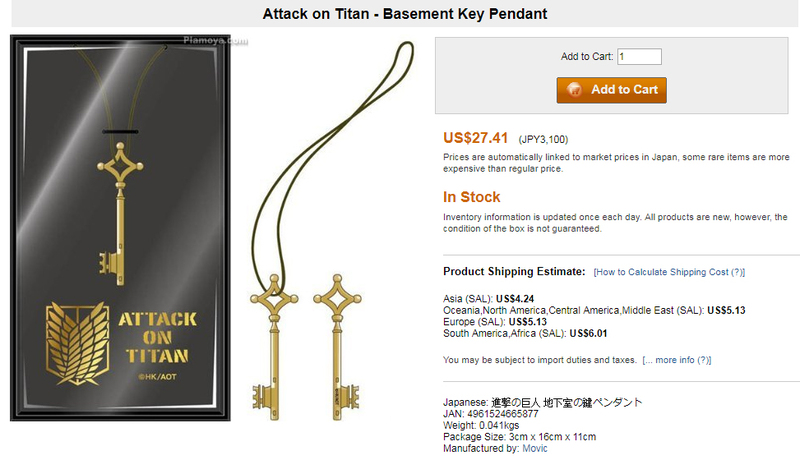 So who’s responsible for this fake Attack on Titan key pendant? 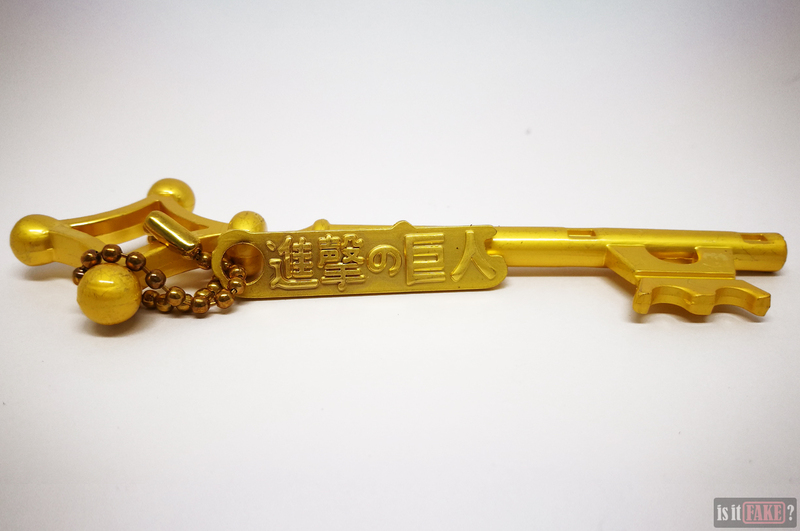 Various details adorn the front and back of the item’s packaging, but none of them identify the key pendant’s manufacturer. As you’ll always find a legit manufacturer’s name and other information on a licensed item’s packaging, the absence of such data is highly suspicious. This suggests the makers of this specific accessory don’t want the key pendant to be traced back to them. 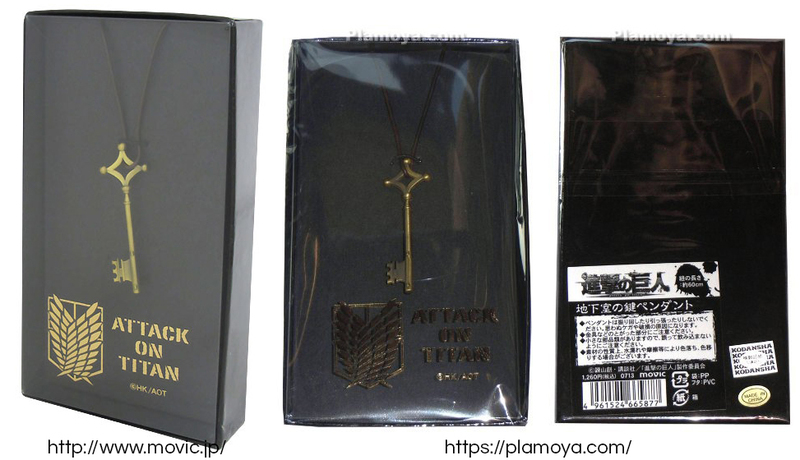 The packaging of the fake Attack on Titan key pendant is a cardboard panel over which is fitted a transparent plastic shell. 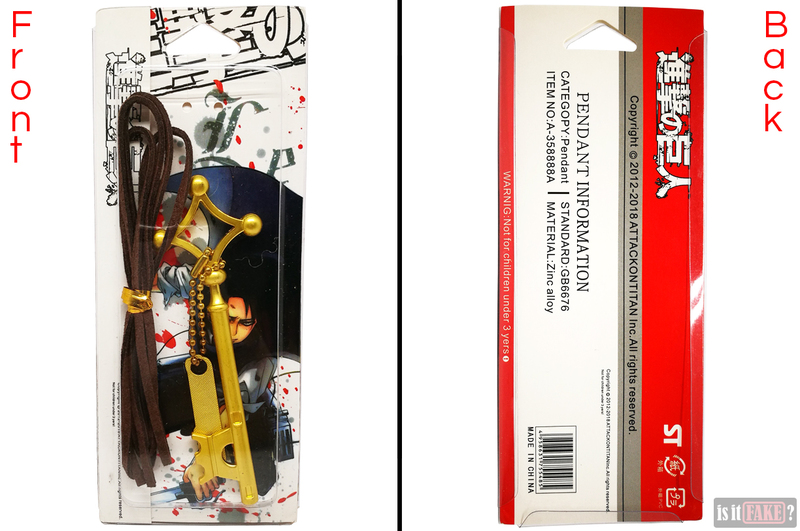 As stated earlier, the packaging doesn’t tell us anything regarding the key pendant’s creator. It does bear a copyright notice, but the absence of vital information about the manufacturer makes it fairly useless. 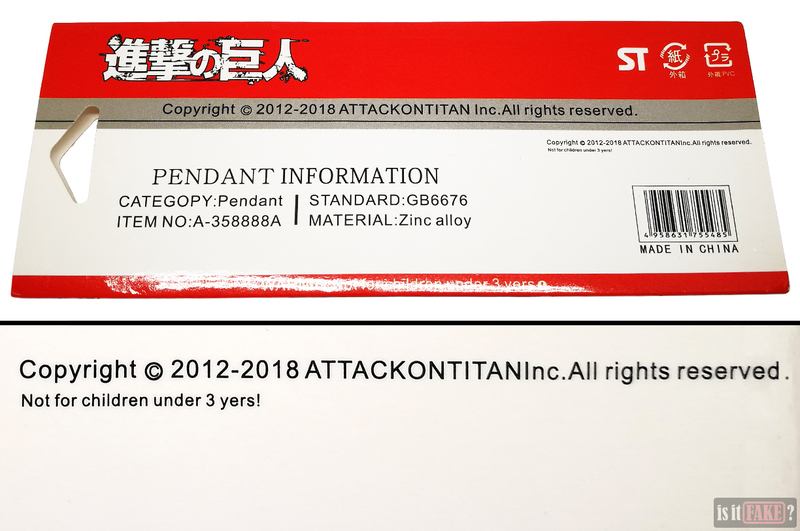 Thanks to the presence of the official Japanese Attack on Titan title and logo on the back and front of the cardboard panel, one could be tricked into thinking this item is legit. The front even boasts official artwork. But there are other clues pointing out this key pendant’s true nature. 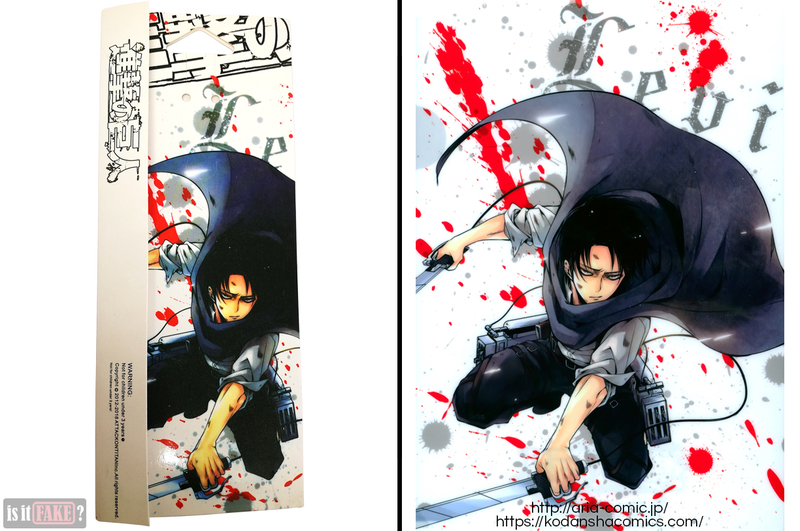 For one thing, the character on the artwork is Levi Ackerman. While Levi is ridiculously popular among fans, it would’ve made more sense for series protagonist Eren Yeager to be the one featured in the illustration, as he is the owner of the key, not Levi. The artwork was also taken from the A Choice With No Regrets manga, an Attack on Titan offshoot series focusing on Levi’s origin story. Again, as Levi is only tangentially related to the key, it makes little sense to have him front and center on the packaging. On the back of the cardboard, we see official Japanese recycling symbols. 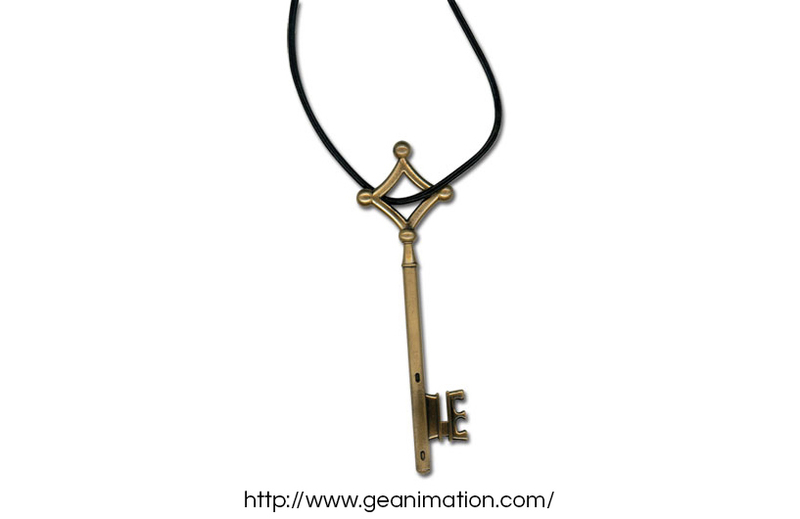 Along with the series title and logo, this again gives the fake key pendant a semblance of legitimacy. Fortunately for us, all this is offset by the bogus barcode which, when scanned, yields no results related to Attack on Titan. 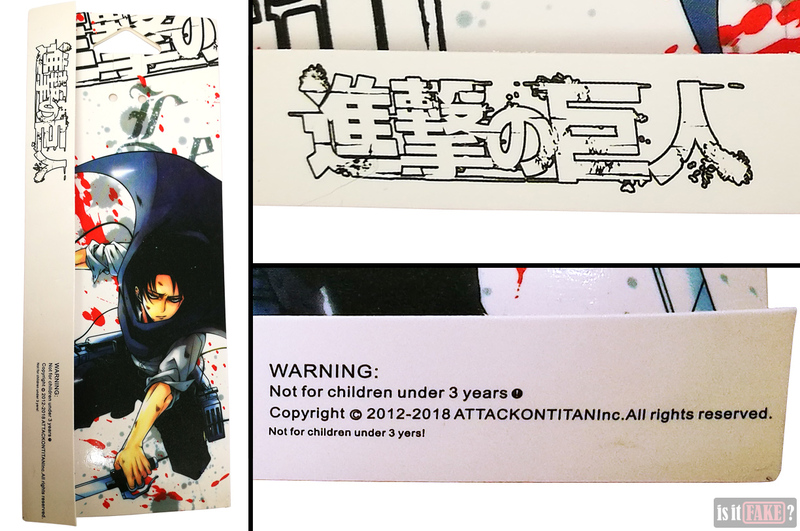 In addition, we have the word “CATEGORY” misspelled as “CATEGOPY,” and the weird way “Attack on Titan” is written with no spaces in the copyright notice. As for the key itself, it takes a single glance to tell what’s wrong with it. 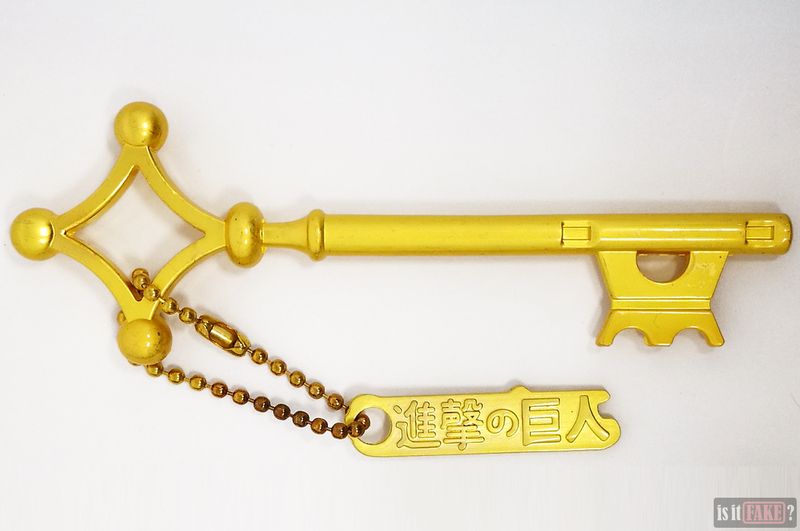 Let’s not mince words; this fake Attack on Titan key is far too yellow. And it’s not just any yellow, it’s a very strong yellow that’s almost painful to look at. 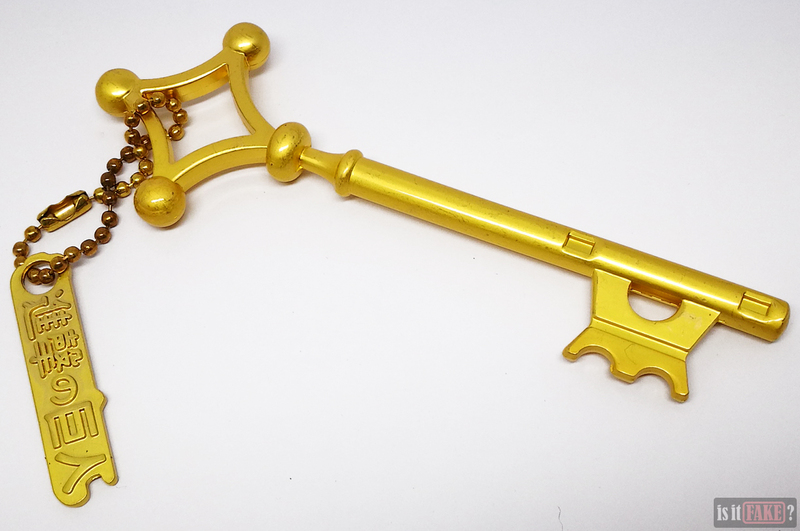 As such, it looks more like a shiny toy replica than a shiny actual key. 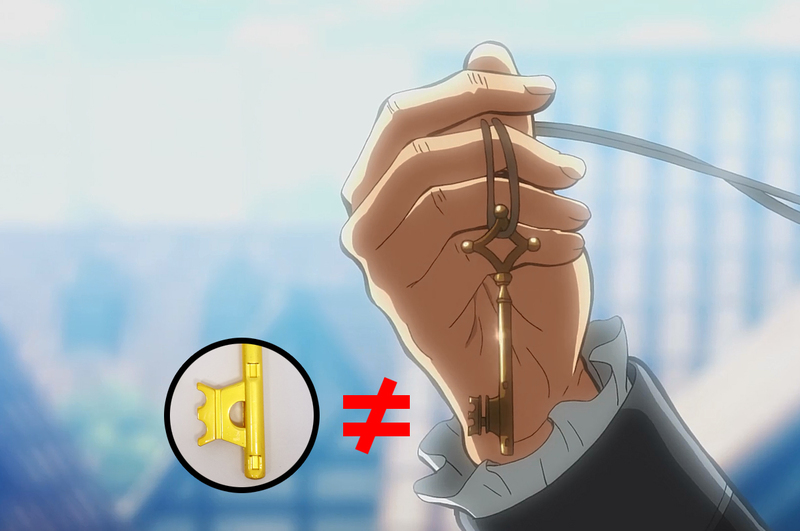 The key rarely appears in the anime, but when we do catch a glimpse of it, it’s obviously a dull kind of gold. 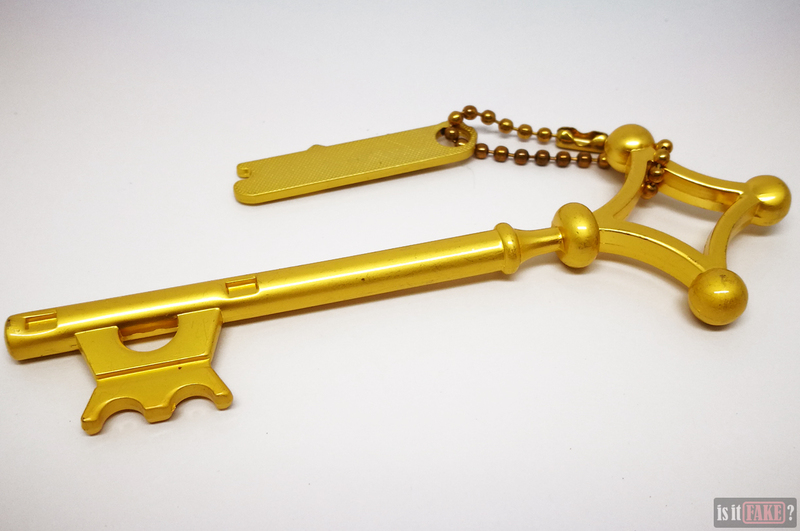 From the screencap above, you can also see the fake key’s bit is shaped differently from the anime version’s. Additionally, the fake Attack on Titan key is stained with dark dots and ugly brown smudges. 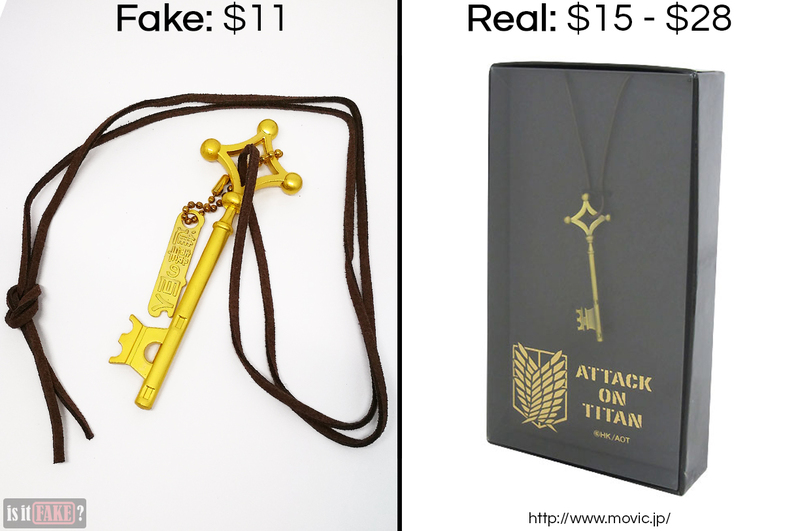 The fake Attack on Titan key pendant has a short chain to which is attached a tag embellished with the Japanese Attack on Titan title. In contrast to the official title and logo, the fake’s の is on the small side, giving the whole thing an awkward. imbalanced look. 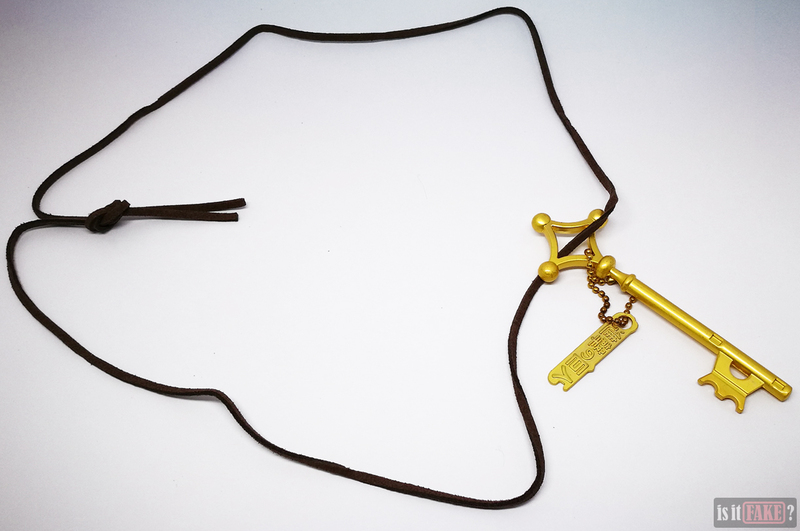 The fake key pendant also comes with a brown strap so that the pendant can be worn around the neck. The strap looks like poor-quality shoelace, with messy clumps of fabric sticking out all over the place. 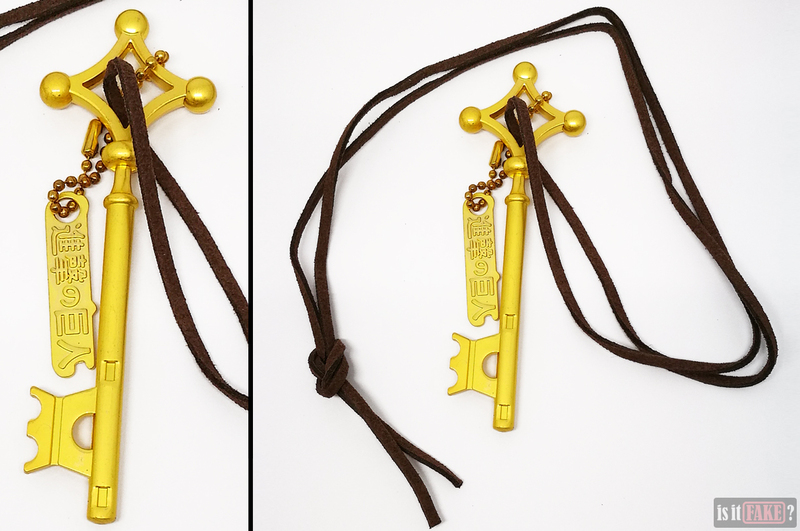 Last but not least, let’s talk about the materials used in the manufacture of this fake Attack on Titan key pendant. According to the packaging, it’s zinc alloy. Unfortunately, with this item being a bootleg, we can’t be too sure about the accuracy of this claim. The fact is, many fakes produced in Chinese factories are tainted with harmful heavy metals including but not limited to cadmium, lead, mercury, and arsenic. These substances have been associated with skin irritation, reproductive problems, and even cancer, among many other issues. So while a fake costs less, it’s far more likely to pose a danger to your health. The fake is cheaper, sure. But with the official product, you can be assured of superior quality as well as safety. Movic is a Japanese publisher of anime products. 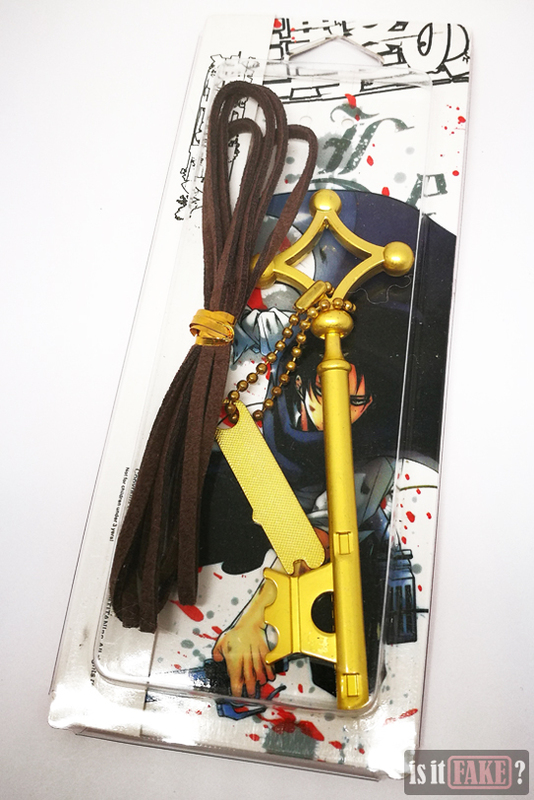 The official Movic Attack on Titan key pendant was previously available on their online store for only $11, but is now out of stock. 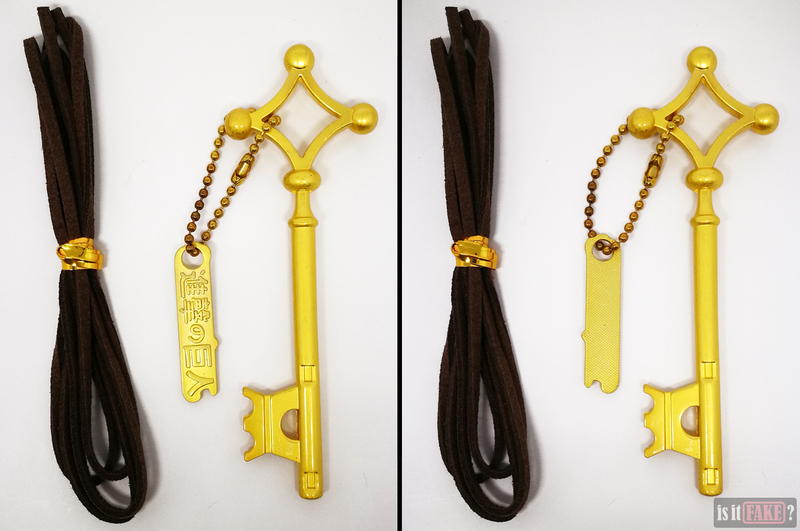 However, as you can see below, that same key pendant is available on Plamoya for $27. 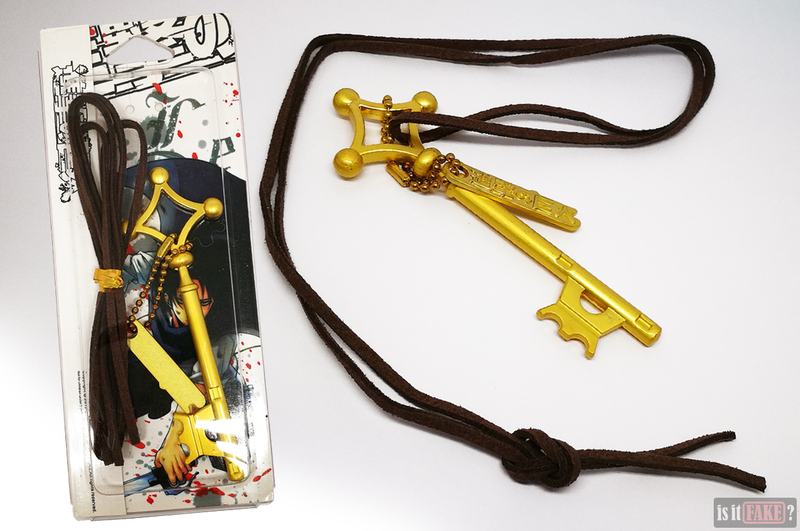 Licensed anime products manufacturer Great Eastern Animation also has their own version of the Attack on Titan key pendant. You can find it on AAA Anime for $15. 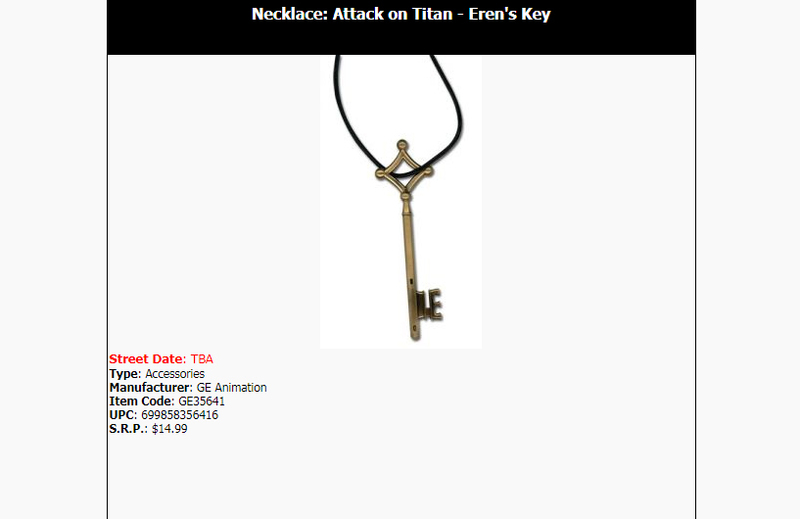 There’s no argument here; an Attack on Titan relic as meaningful as Eren Yeager’s key makes for a great pendant. But that’s only true when said key doesn’t look like an overly yellow toy replica with a strap that resembles shoelace. Because this fake happens to be all that, we have no choice but to attach a 65% terrible score to it.